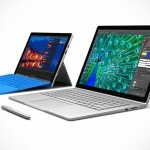 Microsoft has unveiled a series of new Surface products at its October 2, 2018 event. 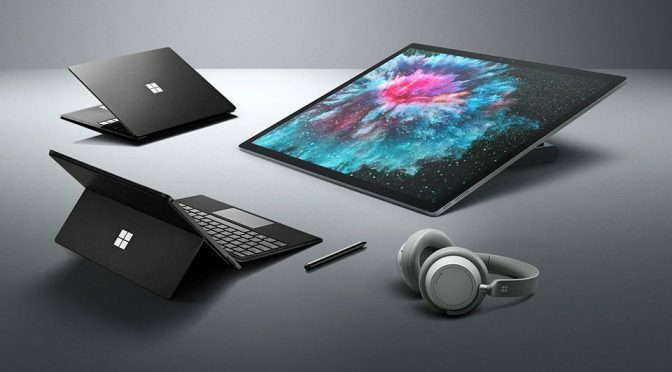 During the event on this day, the Redmond software giant took the wraps off a host of Surface devices, including the Surface Pro 6, Surface Laptop 2, Surface Studio 2, and a surprise device that most people didn’t expect: a pair of Surface-branded Headphones with Cortana integration. The Surface Pro 6 is an impressive device that managed to pack an 8th-generation Intel CPU and an all-day battery offering up to 13.5 hours of use into a relatively thin profile slate. It features a full friction hinge for seamless transitions between laptop mode, studio mode and tablet model. Fronting the device is a 12.3-inch PixelSense Display and it comes equipped with 8 MP autofocus camera. Surface Pro 6 is available for pre-order, starting at $899. The other Surface, the Surface Laptop 2, is also blessed with the 8th Gen qua core processor with a battery that provides up to 14.5 hours of use. In addition, it touts a 13.5-inch PixelSense Display with an edge-to-edge display and ultra-thin bezels. It also boasts faster and quieter display, as well as OmniSonic speakers. Pre-order is open for the Surface Laptop 2, starting at $999. And then there is the Surface Studio 2 which is billed as the ultimate creative studio with 50 percent more graphics performance. 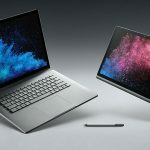 It is the fastest Surface ever made, now outfitted with a rather enormous 28-inch Brilliant PixelSense Display, along with USB-C support, Xbox Wireless, and there’s the latest Surface Pen that has tilt sensibility and 4,096 levels of pressure. Surface Studio 2 will work with Surface Dial too. Books for pre-ordering the Surface Studio 2 is open, but this ain’t no affordable rig. Prices start at a rather alarm pricey $3,499. Finally, there is the Surface Headphones. This audio cans from Microsoft features the company’s voice assistant, Cortana, integration, plus 40 mm Free Edge driver, Bluetooth technology, adjustable noise cancellation, 4-beam forming mics and a rechargeable battery that get to full charge in 2 hours and offers up to 15 hours of operation. 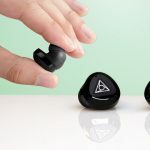 Moreover, it boasts automatic pause and play that will pause movie or video when you remove the cans from your ears. Microsoft is asking $349 in return for the Microsoft Surface Headphones when it becomes available later this year. 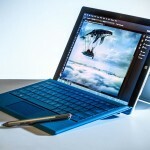 Are You Ready For the First Ever Microsoft-built Laptop and the New-Generation Surface Pro?